I would have pegged myself as a smarter person in a dire situation. The sort who would make the right call. But I froze instead. When the wormy green witch made her way down the hall, I said nothing. ManQuail must have been in as much shock as me. He didn’t run away. He didn’t yell in terror. We both just stood there in shock like a couple of dumbasses. And she knew we were there. She crept so slowly down the hall. Her black eyes, face crawling with worms, stared right at us. I could almost picture the Wicked Witch of the West in that hallway, only this one didn’t wear the black clothing and pointed hat. She was naked and crawling in filth and decay. Even her spirit emanated a stench of dead fish. Nor did she carry a wooden broom around with her like the character Margaret Hamilton made famous back in 1939. 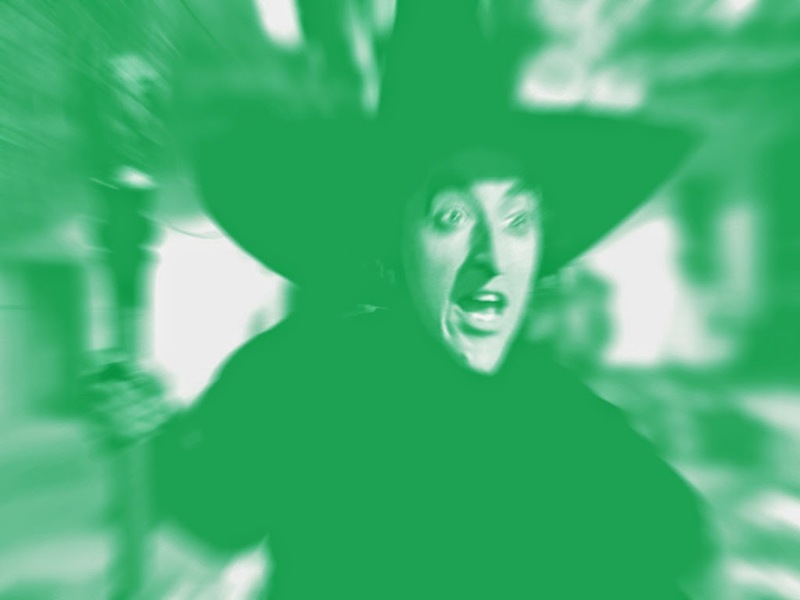 When I was a kid, the Wicked Witch gave me nightmares. This thing heading toward us today, however, made me never want to sleep again. What could a spirit do to harm us? That question began to bubble in my head. I’d seen enough movies as a kid in the 80’s to know they could do quite a bit. Mentally, they could toss ManQuail around like a softball while I hung on for deal life to his feathered back, smashing us both against the wall. They can bleed a psychic sense from their ephemeral bodies that creates dread and fear. In fact, I wouldn’t be surprised if that’s what this wormy witch had going on. I could do nothing but watch her approach. Only it didn’t last that long. When the door to the bathroom swung open, the ghastly apparition wasn’t yet close enough to touch us, but very nearly. We could hear her cackling laugh as if she were whispering into our ears. That all changed when Diana Sturgis, wearing nothing but a towel, stepped into the dark hallway. “Grandma? Get out of here!” The CEO of Flight Services shouted. She waved her arms in front of her, fearless of the spirit before her. Her towel loosened around her breasts, threatening to slip off, and I found my eyes had averted from the witch to a much more pleasant sight. Odd how the allure of a beautiful woman can shake even the terrors of the dead. “I need space, Grandma. I can’t deal with this!” The towel didn’t fall, unfortunately. She tucked it back into place as she stepped further toward the ghost. Her grandmother, as nasty and repulsive as she was, faded silently and sullenly into nothingness. The Wicked Witch of the West, in his spidery head. That’s when Diana noticed the two of us. I wasn’t sure if she would burst into screams or chase after us at the sight. Instead, she stuck one slender leg out like a hitchhiker trying to get a ride. It glistened from the candlelight. Beads of water trickled down her inner thigh. Shaking the dregs of fear from my system, I bounced from ManQuail and landed somewhere between Diana and my companion. A flash of white lightning lit the place up for a split second. Glenn warned me to be careful as I approached the woman. She looked at me quizzically. Who knew what went though her head? Were I in her shoes, or towel, I’d be wondering what the hell a tarantula would possibly be doing back in my house. I held up one of my long legs and waved it around slowly, signaling to her that I needed something. She watched my leg twirl for a moment or two. A look of disbelief nestled firmly over her eyes. I kept at it until she spoke. “Do you understand what I am saying?” she asked. I stopped twirling. Instead I bobbed my leg up and down, mimicking a nod as best I could. Concern creased her brows then. She took a deep breath. Now I knew for certain she knew a thing or two about our predicament. I bobbed my leg up and down once again. ManQuail moved closer behind me. “She knows, man! She knows who we are!” Glenn shouted excitedly. I needed something to write with, so I motioned for her to follow, and wandered into the rest of the dark house. I noticed a glowing screen on the glass coffee table in her living room, near the spot where she’d nearly killed me with the painting of her grandma. She’d long since cleaned up after that episode, but I could still feel the presence of the painting in the room, thanks in a large part to her grandma’s ghost. I ran to the computer with speed not normally attributed to arachnids and settled in front of the laptop. Her email was up. I saw she’d just responded to an email from Kip Mooney, the reporter. I took a moment to glance at the reply. “Looking forward to seeing you tonight. Bring the wine!” She wrote only a couple of sentences, but the words stirred a well of jealousy in me. I looked over at the woman as she set herself on the couch. 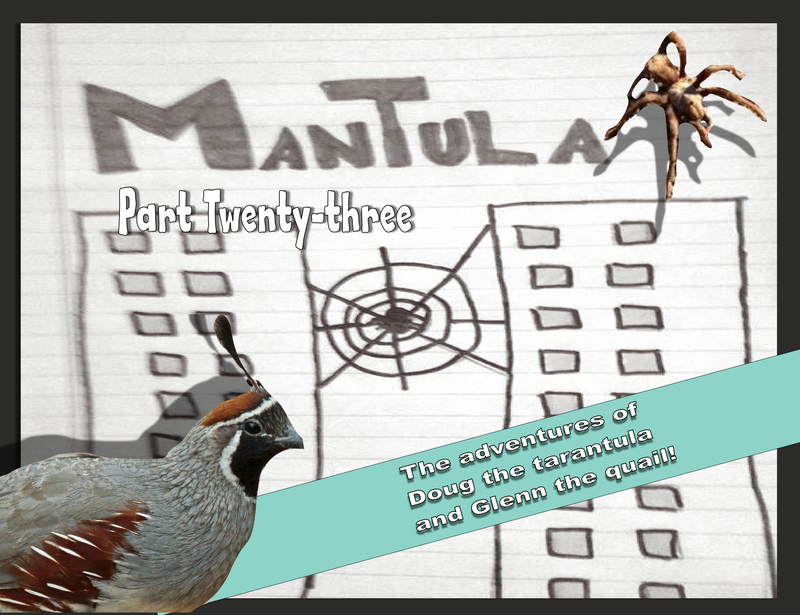 ManQuail approached the area furtively, as if not entirely trusting the woman not to burst into violence. I opened a new email and started typing. I very nearly asked her about Mooney, whether she knew he was a drug dealer, but decided to stick to the business at hand. I bobbed my leg again, which was faster than typing. “What do you know?” I asked her. “A curse?” ManQuail asked in my head. A curse. That’s just wonderful.